I liked the above quote so much, I had it tattooed on my forearm in Elvish, some time ago. Happy birthday, John Ronald Reuel Tolkien. John Ronald Reuel Tolkien, CBE (3 January 1892 – 2 September 1973) was an English writer, poet, philologist, and university professor, best known as the author of the classic high fantasy works The Hobbit, The Lord of the Rings, and The Silmarillion. Tolkien was Rawlinson and Bosworth Professor of Anglo-Saxon at Oxford University from 1925 to 1945 and Merton Professor of English Language and Literature there from 1945 to 1959. He was a close friend of C. S. Lewis—they were both members of the informal literary discussion group known as the Inklings. Tolkien was appointed a Commander of the Order of the British Empire by Queen Elizabeth II on 28 March 1972. 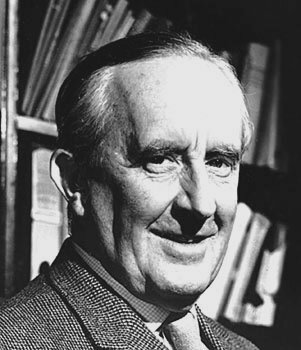 After his death, Tolkien’s son Christopher published a series of works based on his father’s extensive notes and unpublished manuscripts, including The Silmarillion. These, together with The Hobbit and The Lord of the Rings, form a connected body of tales, poems, fictional histories, invented languages, and literary essays about an imagined world called Arda, and Middle-earth within it. Between 1951 and 1955, Tolkien applied the term legendarium to the larger part of these writings. While many other authors had published works of fantasy before Tolkien, the great success of The Hobbit and The Lord of the Rings led directly to a popular resurgence of the genre. This has caused Tolkien to be popularly identified as the “father” of modern fantasy literature—or, more precisely, of high fantasy. In 2008, The Times ranked him sixth on a list of “The 50 greatest British writers since 1945”. Forbes ranked him the 5th top-earning dead celebrity in 2009. Tolkien never expected his stories to become popular, but by sheer accident a book called The Hobbit, which he had written some years before for his own children, came in 1936 to the attention of Susan Dagnall, an employee of the London publishing firm George Allen & Unwin, who persuaded Tolkien to submit it for publication. However, the book attracted adult readers as well as children, and it became popular enough for the publishers to ask Tolkien to produce a sequel.